Royal Musings: You may need a scorecard! You may need a scorecard! 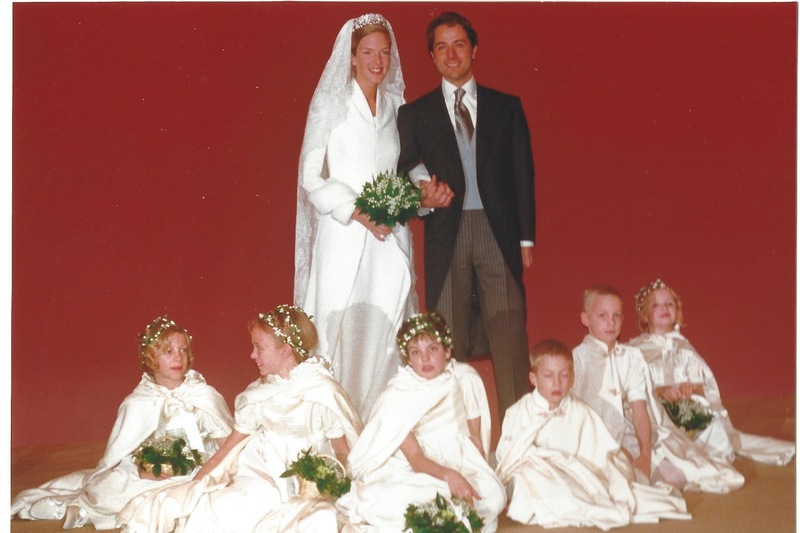 Archduchess Catharina-Maria of Austria, the only child of Archduke Rudolf of Austria and his second wife, Princess Anna Gabriele of Wrede, married Count Massimiliano Secco di Aragona in Ghent, Belgium, in January 9, 1999. The couple resided in Geneva, Switzerland with their three sons, Costantino (2000), Niccolo (2002) and Rodolfo (2010). It seems, however, that the count has left the marital home .. keep reading! Massimiliano is the son of Count Andrea Secco di Aragona and Giuseppina (Giusy) Muchetti (remarried to industrialist Vicenzo Gnutti). Giusy has a sister Clelia, an artist, who married José Carlos Ruiz Berdejo y Sigurta, a lawyer. They have several children, including José-Antonio Ruiz Berdejo y Sirgurta. José-Antonio prefers to use the same surname as his father, as he is a grandson of the Conde Sirguta. His legal surname should be Ruiz Berdejo y Muchetti. His brother, Carlos, uses the correct surname. A businessman, José-Antonio, 50, was born in Milan, Italy, but raised in Seville, Spain. He dated the late Celia von Bismarck, former wife of Carl-Eduard von Bismarck. In 1992, he married Marina Marzotto. The marriage was dissolved in divorce in 1995, and annulled three years later. In September 2011, José-Antonio married Julia Oetker, youngest child of the late Rudolf-August Oetker, and one of the heirs to the Oetker baking products fortune. She is worth more than a billion dollars. Last August, the German magazine, Bunte reported that Julia and José-Antonio were separated. "Julia and I have been separated for a year. It did not work, but we remain best friends." The couple will soon be divorced. José-Antonio, who runs several of his family's businesses and properties, did not stay solo for long. In December, a Spanish newspaper, El Mundo reported on José-Antonio's new romance with Anglo-American Pia Getty, the former wife of Christopher Getty.a grandson of J. Paul Getty. Pia is one of three daughters of Robert Miller, who made billions in airport duty free shops, and his wife, Chantal. Her two sisters are Marie Chantal, who is the wife of Crown Prince Pavlos of the Hellenes, and Alexandra, former wife of Prince Alexander of Fürstenberg (son of designer Diane von Fürstenberg), and now married to architectural designer Dax Miller. Pia and José-Antonio met last summer at the coming out party for Archduchess Eleonore, Archduke Ferdinand and Archduchess Gloria of Austria, the three children of Archduke Karl, head of the Austrian royal house, and his wife, Francesca, a von Thyssen heiress. The party was held in Seville at Casa Pilatos, the residence of the very wealthy Medinaceli family. José-Antonio is a friend of Archduchess Francesca. Just to keep this all straight - José-Antonio Ruiz Berdejo y Sigurta, the estranged husband of Julia Oetker, is dating Pia Getty. Julia Oetker has moved on, and has found a new partner, none other than her husband's first cousin, Count Massimiliano Secco di Aragona, the husband of Archduchess Catharina of Austria. Not only do we need a scorecard,perhaps appropriately colored jerseys may help identify the players with stripes on the arms of the jerseys to identify family, spouses,ex-spouses and possible lovers. What a collection of wayward groupies!! A Greek princess for Prince Harry? Pshaw!